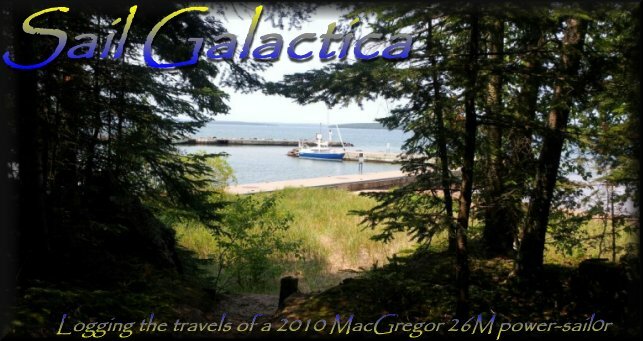 With the late snows eliminating the first couple months of the season, Angie trolled through Macgregor owners websites and found a number of mods that we liked. We moved propane cannisters outside instead of storing them in the bilge. 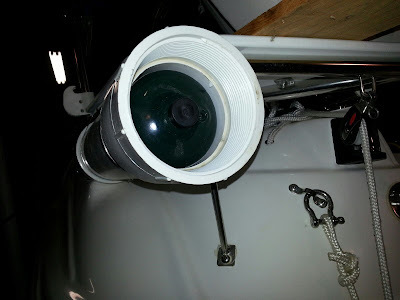 4" PVC pipes with a cap on the forward end and a screw cap on the aft. 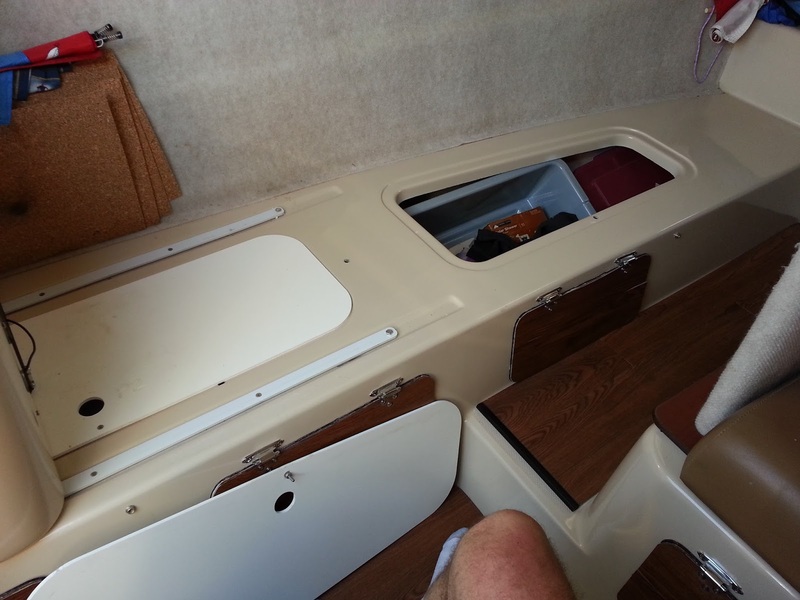 We can store two bottles per pod and there is a pod under each stern rail seat! She found a mod where people increased the usuable space in the salon by removing the big table and creating a U shaped settee. We mocked this up and fell so enamoured with it along with the luxurious comfort, I basically gutted nearly all previous mods. We were feeling like we were living in a storage locker and the mods were heavy in weight. 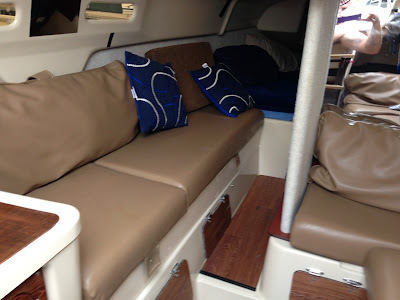 Here is the finished product before we added a seat riser for storage under the forward port settee. That'll be highlighted at the end of this post. We set up the laptop on the folding table and sprawl out on the U-shpaed settee. With the extra pillows, it is very comfortable. 2013 configuration pror to adding the riser to the port bench. 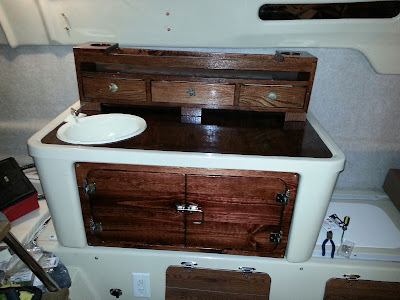 Our previous galley had a 3 burner stove mounted to a shelf/platform with some storage. 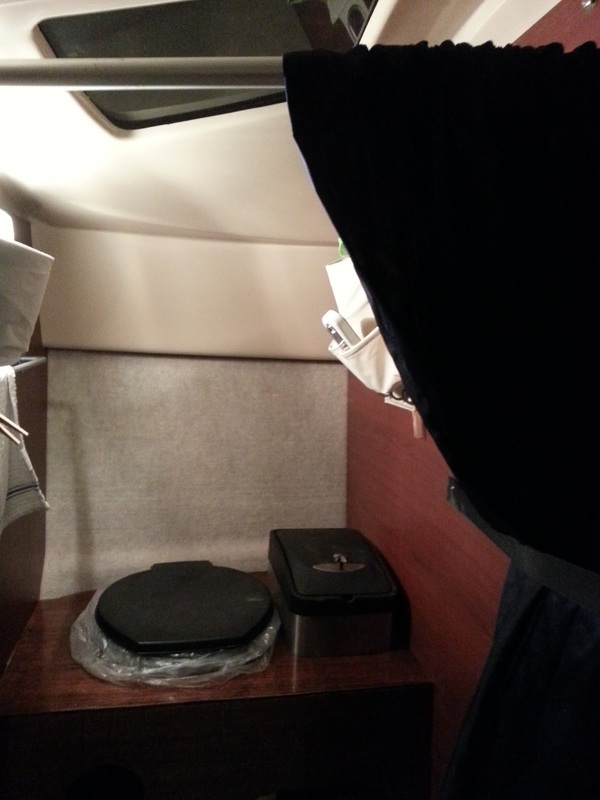 I ended up using up the little seat space behind the galley with a wood Pantry. Angie had to prepare meals on the table...no counter space. The new galley during final stages of installation! I cut out the factory sink, added an oak luann countertop insert and mounted an RV sink in the corner making much more space. I moved the silverware drawers from the old factory table to the back of the galley and installed a 12volt faucet replacing the pump faucet which Angie really didn't like. Moving the water tank to the locker below the galley opened up space in the previously cramped galley. 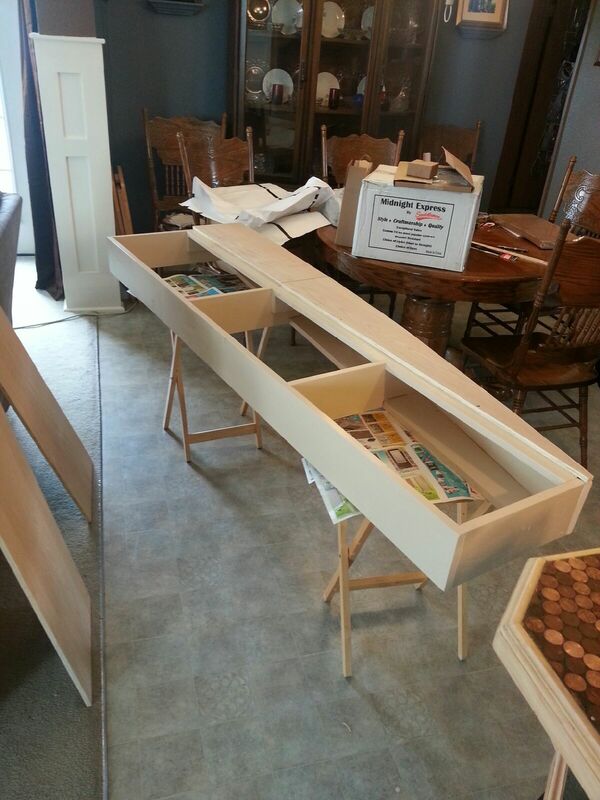 We added drawers and our food totes and this is a GREAT modification! I moved the two storage bins from the front factory face of the galley to the forward side and replaced that face with one with two large doors. Suddenly, we have very usable pantry space!! !The new galley still slides back allowing access to the water tank. We found self stick vinyl wood plank flooring at one of the big box home improvement stores. Lowes, Home Depot or Menards.... I don't recall which. 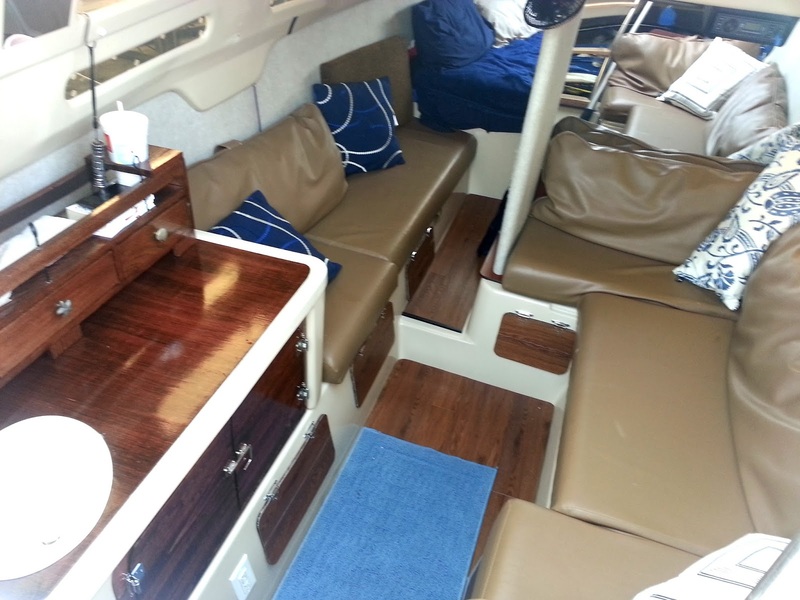 I removed the rugs and mounted the flooring to oak luann cut to the shape of the forward and aft Salon floors. We found that removing piles to remove cushions to access the lockers made it so we just didn't storage the stuff we used in the lockers...hence the cluttered mess. Angie sprayed a white rubber paint to coat the raw interior fiberglass making the lockers brighter and more cheerful feeling. A clean look. We put totes in the lockers to protect anything should there ever be water in the bilge. 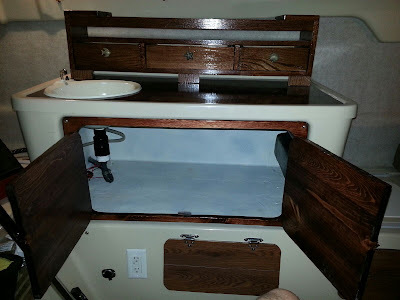 I cut access ports into the sides of the lockers and made port covers out of the same oak luann and the vinyl flooring. Lowes has spring loaded hinges for just a couple bucks per pair. These hold the door closed even when heeled over 45 degrees...we tested it! :) I was able to save money and return all the latches. Preparing to measure the port bench. We each have a small duffle bag with clothing each trip. Enough clothing to match the weather which constantly changes here. Angie also found a mod to raise the forward port bench five and a half inches. Okay, admittedly I'm never going to be a master carpenter but I'm proud of the curved woodwork! I built a similar mod and we use the forward two compartments for our clothing storage. 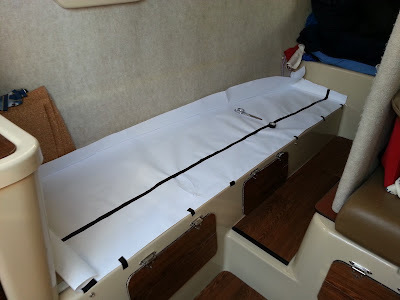 The aft compartment is for storing the two emptied dufflebags, the newer light weight two burner stove, a dust buster and a few odds and ends! The riser, with lids and hinges only weighs 37 pounds. After all the redesign, the boat is hundreds of pounds lighter! My wife is cringing at the messy house. The lids have piano hinges and are easy to open leaving the cushions on! 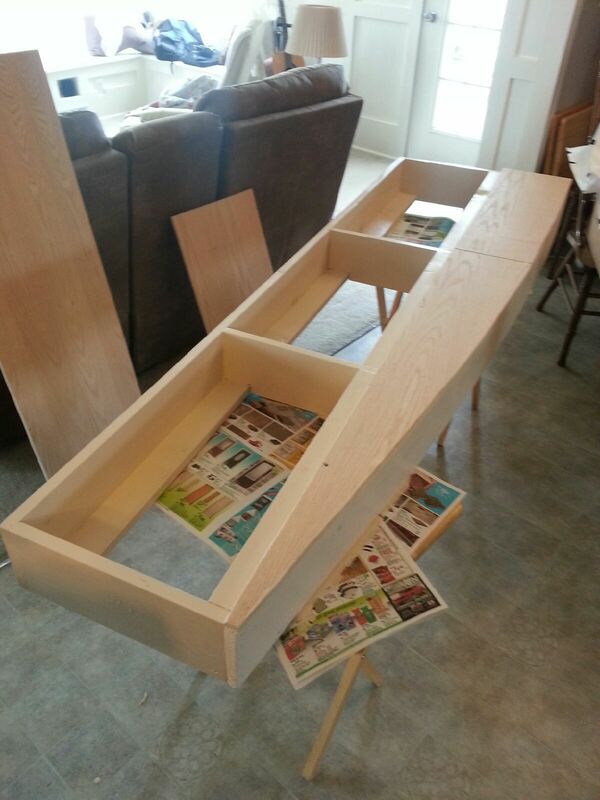 It's constructed with just #2 grade pine 1x6 and oak vaneered 3/8 plywood. At Lowes, I colormatched a picture on my phone of the boats tan interior and painted the riser. It blends in quite well. Compare this picture of the finished, installed riser with the picture of the salon at the top of this post! We really liked this mode too! New cockpit table prior to poly coats! 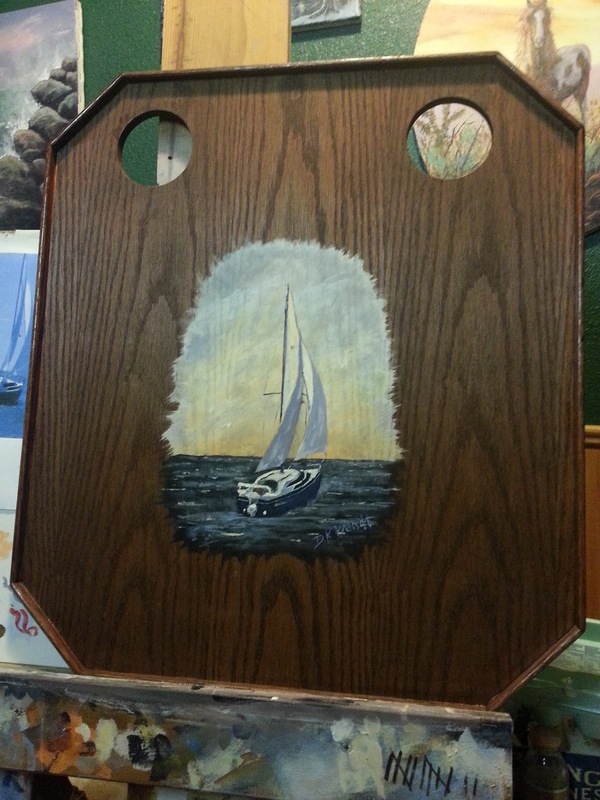 I made a new, oak top for our cockpit table and then painted a picture of Galactica sailing on the Atlantic Ocean. This is protected with 5 coats of poly! More posts to come! It seems I'm busier every year so I have been lagging behind on posting. Coming up: Sailing Memorial Day! Minor Rigging failure! Scientific mission: Water sampling at specific points on the lake for the University of Missouri. The is a work in progress. I'll log the sailing adventures we go on along with modifications to the boat.